Cold Dude Computers: new epf message from Gary! new epf message from Gary! 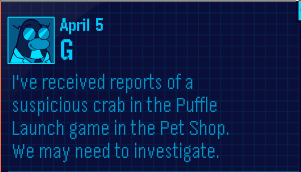 It says: "I've received reports of a suspicious crab in the Puffle Launch game in the Pet Shop. We may need to investigate".